Alcohol Resistant Aqueous Film Forming foams, AR-AFFF, are especially effective for extinguishing and securing flammable hydrocarbon and polar solvent fires. High risk facilities such as refineries, pharmaceutical plants, process areas often require AR AFFF foams. 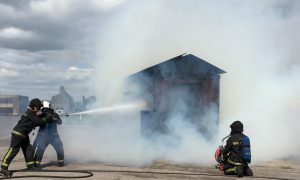 Angus Fire’s TridolC6 ATF is a range of AR-AFFF foams, which are cost-effective foam concentrates containing a unique combination of hydrocarbon and flurorocarbon surface active agents. They produce a vapour-sealing aqueous film that spreads rapidly over hydrocarbon surfaces to provide rapid control and extinguishment. On polar solvents an insoluble polymer membrane is formed which protects the foam blanket from the solvent.